Anybody who has attended one of Michael Crowley’s annual presentations at the Organisation for the Prohibition of Chemical Weapons (OPCW) on the challenges posed by riot control and incapacitating agents for the future of the Chemical Weapons Convention (CWC) knows his passion for the subject matter. And his overwhelming knowledge about the latest developments in science, technology, industry and government policies. These characteristics also typify his book on the topic, Chemical Control, published late last year. as a treatise on the analytical framework that has guided the research and the book structure. Each level has merit in its own right. The third one, however, lifts this book above many other monographs on weaponry. Not just because of the ways in which it has informed Crowley’s research and analysis, but because it opens windows to fundamental debates on the purpose of disarmament and arms control today and tomorrow. He was right to resist calling his analytical framework a theory, but it nevertheless contains elements of theory. He formulates certain assumptions, but the book’s primary goals unfortunately do not give him the space to discuss them in depth. Because Crowley fundamentally questions some traditional understandings of the purpose of disarmament and arms control, he lays down an intellectual challenge that disarmament theorists or international lawyers cannot ignore. The first level is that of the researcher’s data paradise. 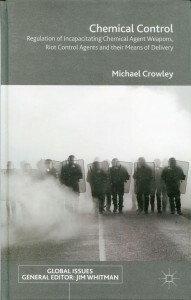 The monograph offers highly technical and detailed information on the nature of riot control and incapacitating agents and their delivery systems, the research and development behind them, where they are being manufactured and how they are traded, and most importantly for the other levels on which the book can be read, where and how they are being used. Chemical warfare has its fair share of horror stories. About the impact of toxic chemicals on the body—from the painful and slow-healing blistering of the skin by mustard agents to the uncontrollable convulsions caused by exposure to sarin or other nerve agents. About the human experiments conducted not just in the Japanese prisoner of war camps in China in the Second World War or the dungeons of the darkest totalitarian regimes, but also in the bastions of Western democracy. Until today veterans in the UK and the USA, for example, are fighting to have their contribution to the national defence effort officially recognised and receive adequate compensation and health care—if they are still alive. However, it is quite a different present-day horror story to read that quite a few states use incapacitants and riot control agents (such as tear gas)—toxic chemicals that some try to sell to public opinion as so-called non-lethal or humane weapons—to torture prisoners or regime opponents. Page after page, table after table Crowley details national practices of certain countries. They beggar belief were it not for the fact that source references make up two-thirds of the pages with tables. Crowley methodically presents the different types of agent together with their characteristics and consequences after exposure, the country armament programmes and practices, and incidents. He never meant those pages to be read in a systematic way; they are detailed reference materials for researchers worldwide. In that sense he comes as close as possible to an encyclopaedic treatment of the subject matter. Future reports by him and other researchers will have to update the data sets. If assimilation of this wealth of data might appear daunting, then section introductions and conclusions pull the main strands of his empirical analysis neatly together. The second level is that of policy advice. I must admit that when I first saw the table of contents and noticed that the final chapter addressed conclusions and recommendations I had concerns about the substance of the book. It is one thing to undertake solid empirical research; it is quite a different thing to lay out arguments (and thereby present data selectively) in support of policy recommendations. Too often such treatises display superior argumentative logic, all the while lacking foundation in factual reality. Or they may sink to the level of wholly speculative ‘may and might’ analyses spinning hypothetical, often worst-case scenarios whose projected consequences then inform policy recommendations. To my relief Crowley avoids this trap because a solid analytical framework structures his analysis (see the third level below). Thus after having laid out the technical aspects and national programmes of crowd control agents, he moves to the regulatory regimes. Again he proceeds systematically. In what amounts to over half of the book, he devotes a chapter each to arms control and disarmament law, international humanitarian law, human rights law, international criminal law, technology transfer control regimes, and UN drug control conventions. For each of the treaties, regulations, policy declarations, or informal arrangements (such as the Australia Group or Wassenaar Arrangement) Crowley presents the reader with a summary of the objectives and tools, an analysis of their implementation, and options for amelioration. In the penultimate chapter he examines how civil society can contribute to the strengthening and implementation of the respective regimes. It comprises a comprehensive overview of ideas that have been explored in the fields of chemical and biological weapon control over the past decade and a half, as well as various initiatives whose primary concern have been the humanitarian and human rights consequences of the application of crowd control agents. In the process the author comments on such activities and suggests further options and improvements. Crowley’s recommendations are rooted in this detailed analysis. He identifies areas of action where governments (and by extension, intergovernmental organisations) have to assume their responsibilities with regard to the strengthening and implementation of the international rules. He also considers how civil society constituencies can contribute to the strengthening of existing tools (e.g., through the development of ethical and professional codes of conduct, educational initiatives, etc.) or develop independent initiatives to track developments (e.g., open source monitoring of the use of crowd control agents or the political and technological imperatives for their further development and international commercialisation) with a view of holding policy makers accountable. The final chapter thus comprises succinct summaries of the issues treated in the preceding chapters and related policy recommendations. As already indicated in the introduction, to me the best aspect of the book is the analytical framework. Crowley calls it ‘holistic arms control’ (HAC). It concentrates on existing arms control and disarmament measures, but seeks to expand on the numbers and types of regulatory measures and broaden the range of possible stakeholders. The ambition is not small: he must weave a net whose meshes are sufficiently wide to catch all relevant data, while small enough to filter out irrelevant elements. Moreover, his construct is multidimensional, capturing the technologies together with national and human security concerns of inappropriate use, all relevant international legal regimes and other types of regulation together with the relative strengths and weaknesses, and possible strategies to reinforce all barriers against misuse of crowd control chemicals. He deconstructs this ambition in the opening chapter and in the process outlines a step by step methodology that will form the backbone for the whole book. Cowley’s rigid adherence to the model contributes significantly to the readability of his analysis: throughout the reader remains aware of the stage of analysis and when particular questions are likely to be addressed. At the same time, he leaves the reader with a strong sense of comprehensiveness by bringing in many elements that one might not immediately consider when touching upon the subject of incapacitating and riot control agents. His discussion of the 1971 UN Convention on Psychotropic Substances is but one example. Recognizing that reliance upon a single disarmament or arms control agreement alone would not guarantee success, scholars have explored a number of concepts, seeking to broaden the range of possible regulatory mechanisms. Although the proposed HAC analytical framework concentrates upon existing arms control and disarmament measures, it attempts to widen the range of applicable mechanisms for regulation, and also the nature of the actors involved in such regulatory measures. Left unsaid is the central question: what is the core purpose of disarmament (as embedded in the Biological and Toxin Weapons Convention (BTWC) and the CWC, two key pillars of the regime against the misuse of incapacitating or riot control agents)? Furthermore, how do treaty regimes evolve in the light of technological, political and social changes over the years since their adoption and entry into force? Humanitarian considerations have over the past two decades taken up a prominent place in the disarmament and arms control discourses. This means that today a different reference framework for judging effectiveness of a convention exists than the one originally intended: the focus of the public debate has shifted from the weapon technology (which must be eliminated) to the consequences of their use under a variety of circumstances on individuals and communities, which in turn has amplified calls to hold those responsible for violations accountable under national and international criminal law. That conflict of purpose is on clear display in the Syrian civil war: many people do not understand why the international community can invest resources in eliminating Syria’s chemical warfare capacity, but does not want to intervene to stop the slaughter of civilians. The issue really becomes interesting when two humanitarian considerations intersect at a given decision-making moment in a disarmament setting, and a choice has to be made. Crowley points to such a moment during the 3rd CWC Review Conference in April 2013 (pp. 130–31), however without realising the underlying conflict (of conscience) that led to the item of incapacitating agents being dropped form the final document. The debate occurred when the number of reported chemical weapon (CW) incidents in the Syrian civil war was rising fast, and only a few weeks after the UN Secretary-General established a mission to investigate allegations of CW use. Including a condemnation of the escalating chemical warfare crisis proved highly controversial. Compromise was possible on severely weakened language only, which was totally unacceptable to the Western Group and Other States (WEOG). The final document was in the balance. Given that Poland was chairing the review conference, failure was not an option for the European Union members. One WEOG ambassador was unable to get updated guidance on compromise language on the questions of incapacitants and Syria from his capital, and therefore had to decide under his personal responsibility (all the while bearing in mind that the successful outcome of the review conference hung in the balance). He opted to go with the compromise language on Syria and (in consultation with the original sponsor, Switzerland) drop references to incapacitants, a key consideration being that the issue could be taken up at a later date. Does such a decision make the CWC less effective? The consensus language in the final document would ultimately form a not insignificant foundation for subsequent action by the OPCW following the sarin attacks in the district of Ghouta less than four months later, and Syria’s accession to the CWC and subsequent disarmament. Outcomes at meetings can result from complex decision processes when different interests conflict with each other and priorities (often in function of developments at the time) need to be established. So, I raise the question whether the global community is best served by finding ways to ameliorate core instruments or by broadening the range of tools in order to capture a particular issue of interest? I have no immediate answer because, as the book describes, science and technology and their application in various circumstances may evolve much faster than the international community can regulate them or update existing treaty regimes. Nevertheless, I do have the concern that multiplication of treaties and other regulatory instruments lead to different lists of states participating in each one of them and different levels of compliance and enforceability. That could lead to a cacophony of expectations based on different requirements and interpretations of obligations. This final reflection is not a criticism of Chemical Control. The question touches upon theories of regime formation and international law and goes beyond the purpose of Michael Crowley’s book. However, it is a matter I definitely wish to engage him on. I can only commend him for offering a solid framework for structuring that particular debate on the future of disarmament and arms control and identifying the fundamental assumptions underlying both concepts.